CONGO FRANCAIS 1900-1904, 5f "avenue des Cocotiers á Libreville" variété "CENTRE & FACIALE RENVERSÉ", neuf gomme d´origine sans charniére, TTB et variété RR (tirage probablement une feuille = 50 ex). Signé A. Brun et certificat Pascal Scheller. 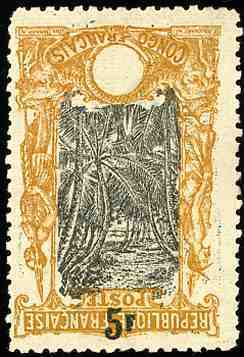 French Congo, 1900, 5f "Coconut Grove" INVERTED CENTER VARIETY, mint never hinged, original gum, very fine and extremely rare. 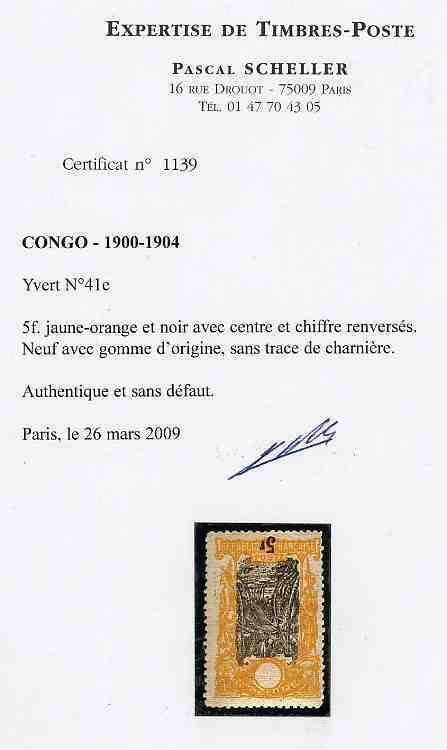 Probably only one sheet of 50 printed and very few known in MNH. This Center Inverted was missing in most major collections ! Scott 49b, Yvert 41e. Französisch-Kongo 1900, 5f "Kokospalmen Allee" mit Mittelstück kopfstehend, postfrisch, RR, wenige bekannt.